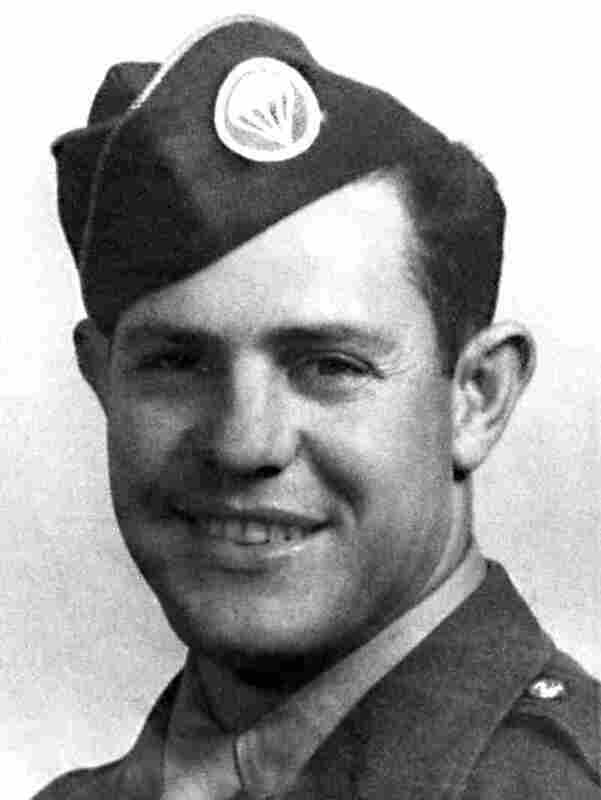 Jake McNiece, WWII Hero And Self-Described 'Troublemaker' Jake McNiece was the leader of a crack U.S. Army paratrooper unit that dropped behind German lines on D-Day. With their wild antics, McNiece's group was known as "The Filthy Thirteen" and inspired Robert Aldrich's macho film classic The Dirty Dozen. Hundreds of the 16 million men and women who served in WWII are passing away each day. On June 5, 1944, Jake McNiece (right) led a group of paratroopers in World War II. After he shaved his head and painted his face before dropping behind German lines for D-Day, the look caught on with his men. Sixteen million men and women served in uniform during World War II. Today, 1.2 million are still alive, but hundreds of those vets are dying every day. In honor of Memorial Day, NPR's All Things Considered is remembering some of the veterans who have died this year. The Dirty Dozen was a Hollywood hit, but it was based — loosely — on a true-to-life WWII paratrooper regiment. Jake McNiece led the group, whose exploits inspired the 1967 movie and earned the nickname "The Filthy Thirteen." McNiece died in January at the age of 93. While the movie took liberties with The Filthy Thirteen, the real-life McNiece was no less colorful than Maj. John Reisman, the character played by actor Lee Marvin. As McNiece recalled in an interview a few years ago, he considered himself "the head troublemaker" of a group of troublemakers. On the eve of the Normandy invasion in 1944, his men jumped behind German lines. Some called it a suicide mission. 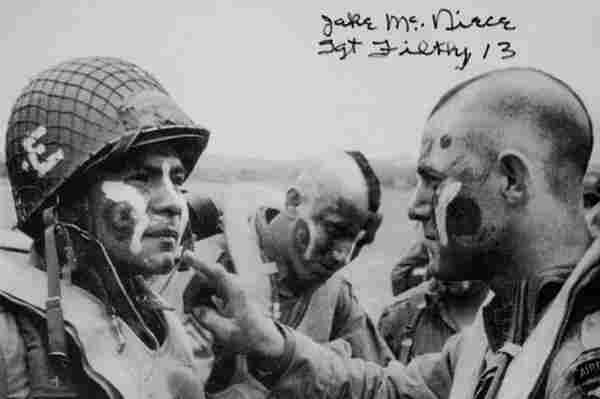 For the D-Day jump, McNiece shaved his head and painted his face — and the look caught on with his men. "So I started cutting their hair and I put markings all over their face for camouflage," McNiece recalled in a 2008 interview. "And it looked like a bunch of war paint with Indians." McNiece received four Bronze Stars, two Arrowhead Bronzes and was appointed a Knight of the French Legion of Honor. "It was a morale booster," says McNiece's widow, Martha. "And it not only scared the Germans; it scared the Frenchmen when they landed in France." McNiece's son, Hugh McNiece, says it wasn't just the unorthodox haircuts that earned The Filthy Thirteen their name. "They didn't take a lot of baths and they didn't keep their barracks very clean," he says. "And that went along with just a lot of disregard for military discipline." In a 2002 interview, Jake McNiece said The Filthy Thirteen got away with a lot of stunts. "We went AWOL every weekend that we wanted to, and we stayed as long as we wanted to. We stole jeeps; we stole cranes. We blew up barracks; we blew down trees. And we stole the colonel's whiskey," he said. That sort of misbehavior was a long way from the The Dirty Dozen portrayal of a team comprising murderers and psychopaths. But the Hollywood spin stuck. "The Filthy Thirteen had to live down the fact that they weren't criminals for the rest of their lives," says Martha McNiece. Understandably, Jake McNiece never was a fan of The Dirty Dozen — yet the movie, in a scene where Lee Marvin portrays Maj. John Reisman, captured an element of truth about The Filthy Thirteen: "Look, they might not be pretty, but any one of mine is worth 10 of yours," says the major. "My contention is that my men are more than able to handle any job given them." After D-Day, McNiece helped resupply troops in the Battle of the Bulge and took on other tough assignments. He received four Bronze Stars, two Arrowhead Bronzes and was appointed a Knight of the French Legion of Honor. Earlier versions of this story incorrectly said Jake McNiece died in February. He died in January.